Former Liverpool boss Rodgers and current Liverpool gaffer Klopp. Every football fan would love to witness their team flourishing and scoring an absurd number of goals. Under Jurgen Klopp, Liverpool is doing just that, showcasing the brilliance of counter-attacking football, especially with the lethal triumvirate in Roberto Firmino, Mohamed Salah and Sadio Mane who have scored 68 goals this season between them with more than two months of football left. Liverpool in previous decades usually had one reliable striker in front of goal, from the club's all-time leading scorer, Ian Rush to strikers like Robbie Fowler & Michael Owen. We shall look at the transition in Liverpool's front line over the last 4 years. 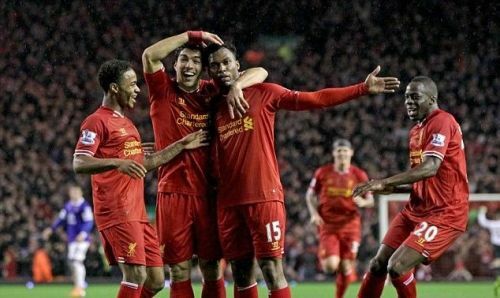 The club's sensational performances in the 2013-14 season under Brendan Rodgers was about Luis Suarez alongside Daniel Sturridge and Raheem Sterling combining to tear up opposing defences. Sturridge scored 23 goals and was second on the top scorers list only to Suarez who netted an incredible 31 goals that season to win the Golden Boot. It was deemed as one of the most fearsome attacks in the world at that moment in time as the chemistry between those three was phenomenal, though they did not get to play for more than one and a half season together. Since then, the Uruguayan left the Mersey-siders for Barcelona in 2014. A year later, young prodigy Sterling earned himself a transfer to Manchester City and Sturridge is currently on loan at West Bromwich Albion until end of the season. Sturridge's future at Liverpool is in doubt after falling down the pecking order under Klopp and it is likely the Reds will cash in on the former Chelsea man.